As we sped through the Thar desert, sand clouds trailing in our wake, a hazy mirage of golden stone crenellations came into view. 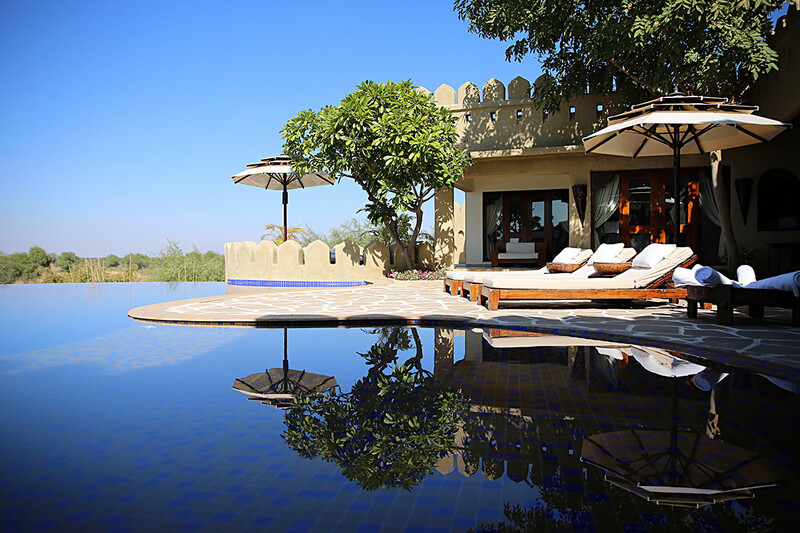 Standing alone in splendid isolation is Mihir Garh, the result of a 12-year dream by Rajput husband-and-wife owners, Sidharth and Rashmi Singh. This place is different. This place is special. 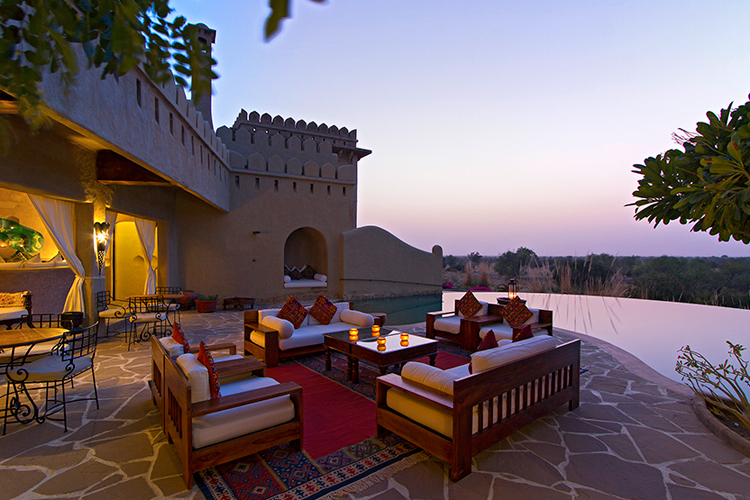 This is quite possibly my favourite place to stay in the whole of Rajasthan. 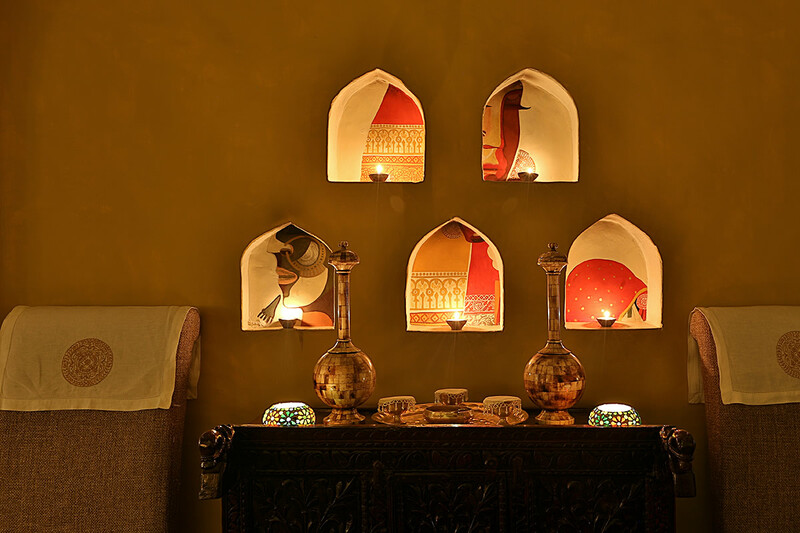 Mihir Garh provides a haven of great comfort, with 9 large suites, each with adjoining sitting rooms and all stunningly decorated in soft, earthy colours and with a Moroccan / African / Rajasthani air. Each has its own courtyard and glorious terrace facing out to the surrounding countryside and with either a plunge pool or a Jacuzzi. It’s light and open with inner courtyards and spacious roof terraces for peaceful yoga sessions or romantic dinners under the stars. A gorgeous infinity pool, shady sitting areas and a barbeque area all fan out from the dining room which is wonderfully airy in summer and warm and cosy in winter. 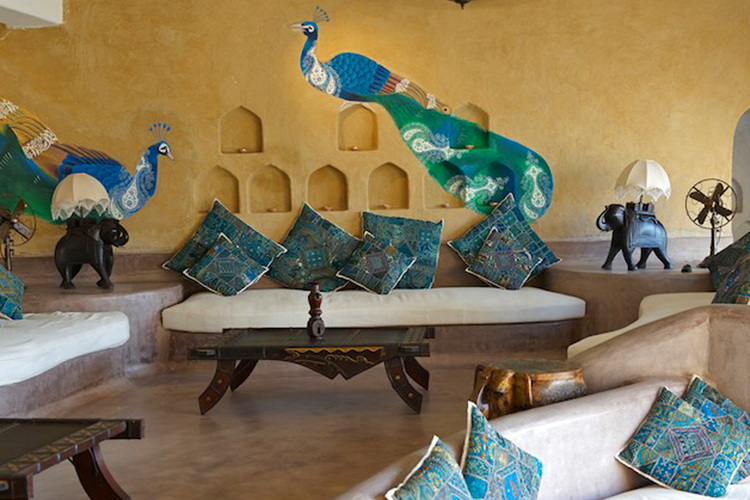 The idea at Mihir Garh is to give people an authentic ‘desert or equine experience’ whilst being luxurious and different. The brains and inspiration behind this magical, small hotel, built of mud, wattle and wood, are the Rohet Family who are exceedingly keen horsemen and who boast some of the country’s finest horses. Come here to ride, explore the wonders of Jodhpur, go on a camel or village safari, or pamper yourself in the excellent spa. Privacy and intimacy are the bywords here. A unique place where the outdoors comes indoors! One of the highlights here is the superb village safari showcasing the prevalent Bishnoi tribal culture surrounding Mihir Garh. This is some of the most stylish, inspiring accommodation that I have come across in India, There are 8 large, luxurious suites and 1 smaller, twin-bedded suite (Black Buck). Decor is of a similar and very high stylish standard throughout, though each has a different colour scheme. 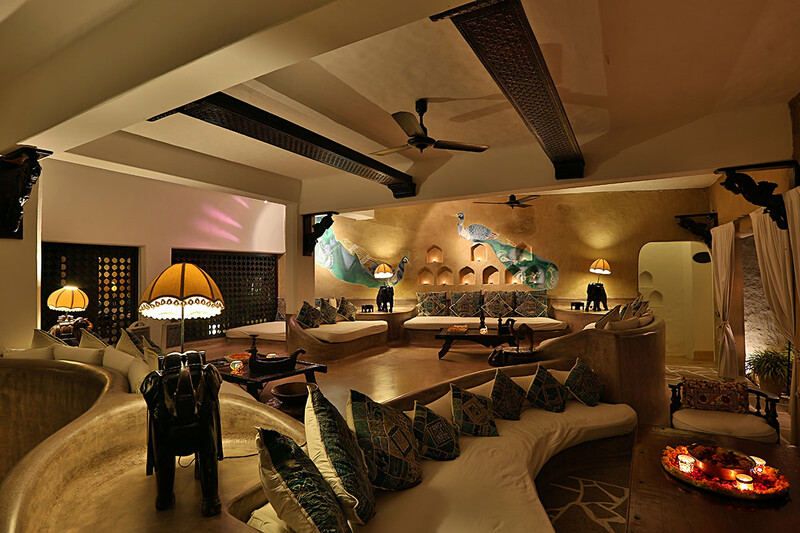 Social spaces throughout the hotel include peacock-painted and colourful open-sided lounges, a princely drawing room with library, and a lounging sunset-viewing roof terrace. Black Buck: Attached to the Mihir Suite, this ground-floor suite is furnished with twin beds, a TV, DVD, minibar, and a bathroom with twin vanities. Alishan: The ground-floor suites feature a private courtyard with plunge pool and pool deck. Indoors, there’s a choice of king-size or twin beds, as well as generous living area with fireplace, TV, DVD and minibar, and a bathroom with twin vanities, a shower, and a handcrafted bathtub. Shandar: The first-floor suites each have a private terrace with Jacuzzi and sitting area. Inside, there’s a king-size bed or twin beds, a living area with fireplace, TV, DVD and minibar, and a bathroom with twin vanities and a separate shower and bathtub. Mihir Suite: Located on the ground floor, this two-bedroom suite features a king-size bed and two twin beds, as well as a bathroom with interconnecting doors. The master bedroom opens onto a private deck with plunge pool. Both bedrooms have TV, DVD and minibar, and there’s also a spacious living area. Flooded with sunlight during the day and the warm glow of flickering candles at night, the restaurant offers a choice of freshly cooked Rajasthani, other Indian and continental dishes. 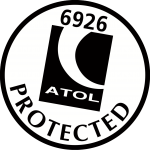 Given sufficient notice, the friendly local chefs will happily create a bespoke menu to your individual requirements. There are also culinary workshops on offer for those who are interested. For something special, ride a camel to the Shikaar camp set up in the desert. Lanterns light the way to a central fireplace surrounded by charpoys (string beds) made comfy with cushions, and a procession of thali dishes and BBQ meats are served beneath the stars.